JW PRODUCTS LTD. was established in 2000 and forms part of The Lockie Group, which is a manufacturer with almost 60 years of experience across a range of industries. Today JW Products continues that tradition of excellence through investment in technology, an expanding product range and exceptional customer service. Our products and knowledge are relied upon throughout the UK and the World by leading cargo, freight, warehousing and shipping organisations. In fact, as you read this our satisfied customers all around the world are using our security seal solutions to safely seal cash bags, clinical waste, cages, containers, curtain siders, doors, enclosures, forensic bags, lorries, medical cabinets, railway cars, roll cages, oil drums, pallets, sacks, tankers, trucks, trailers, tote boxes, trolleys and valves, to name but a few! The PULL-TIGHT PLASTIC SEAL is the most versatile and affordable product within our range of tamper evident seals. They are reliable, robust, weather resistant and customisable. Another benefit of this type of seal is that they can be applied by hand with no special tooling, and if you opt for a tear-off option they can also be quickly removed the same way. We stock an extensive array of pull tight plastic seals in a variety of colours, lengths and variations, in order to assist our customers in finding the ideal specification for the desired application. In the last 6 months alone, we have supplied this type of seal to all types of businesses, from a digital forensics’ company to a dairy product manufacturer, which goes some way to highlight the versatility of these types of seals. The customisation options within this range of seals include barcoding and company logo printing, which when coupled with their affordability and adaptability has led to this ubiquitous product becoming one our most demanded. Our range of VEHICLE SEALS make theft detection or cargo tamper quicker and easier to identify. 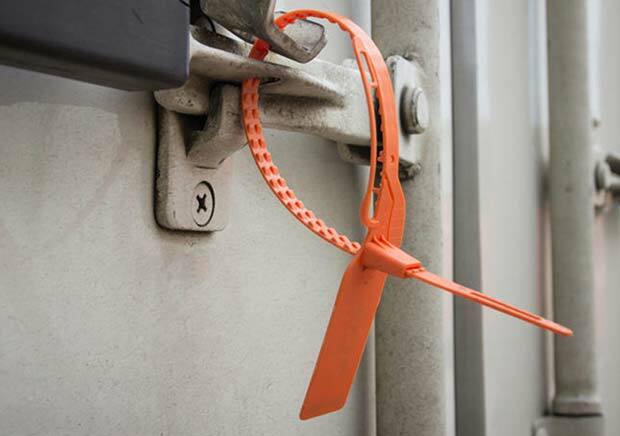 It’s an unfortunate fact that many cargo thefts go unnoticed until a full stock take has been taken at its eventual destination, which in the world of organised crime gives the thieves the head start they need to get away with it! The primary application of a vehicle seal, which we offer as either plastic or metal is to seal HGV doors, petroleum tankers, food tankers, liquid tankers and shipping containers. 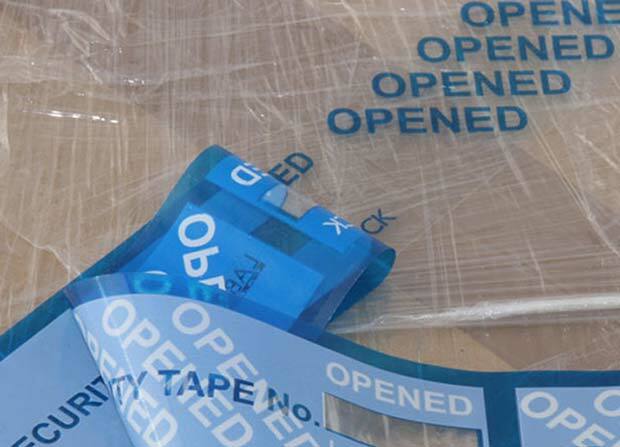 We also offer our customers an innovative range of TAMPER EVIDENT LABELS AND TAPE. Although we offer a range of popular sizes and specifications from stock, we also have the capability to supply you with any size or format to meet bespoke applications. It is fair to say that the variations within this product category are limitless. Our most popular products within this range are the no-residue tapes and labels, as they are widely used within logistics, warehousing, transport and aviation. Once removed a message will be revealed to show obvious signs of tampering which cannot be disguised. Some industry experts suggest that this area of security sealing is experiencing rapid growth as EU legislation continues to play its part and reducing pilferage and brand protection remain at the top of the list for many businesses operational concerns. The independent study from Fact.MR shows that demand for VOID security labels is growing at a brisk pace, accounting for over half of the market share in terms of volume. According to this study, despite growing emphasis on sustainability, plastic still accounts for a large share of raw materials used for production of security labels. Although many manufacturers have reduced the usage of plastic or have shifted to less potent variants, easy availability and traditional use have meant that plastic remains the most widely used material in the security label manufacturing process. It’s a little known fact that CABLE TIES were invented in the 1950’s and have since become the go to solution for all manner of problems – so much so that annual worldwide usage is now measured in the billions! They are also commonly known as zip ties and come in all sorts of colours, sizes and specifications. 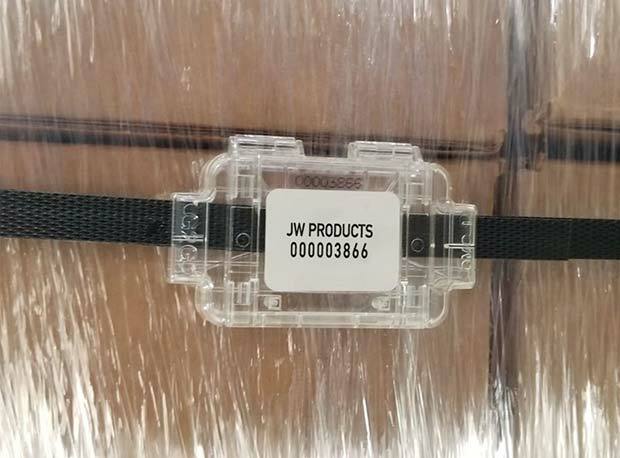 Here at JWP products we are happy to say that we supply more than 30 types of cable ties to our customers from as short as 100mm long, up to 1m long. We offer them in numerous colours, in both single use and reusable specifications and we can even print customised text onto our cable ties. The one-piece nylon cable tie offers a quick and easily applied solution to most binding applications and due to the superior quality of Nylon 66 cable ties that we offer, it allows the user to benefit from a high mechanical strength, stiffness, heat and wear resistance. Why not get in touch today to discuss your requirements? Remember, our range of products is comprehensive, our prices are always competitive and our commitment to our customers is constant. To see our full product range, please visit our website at www.jwproducts.co.uk or call our sales team on 01252 624305 to request a quote today.